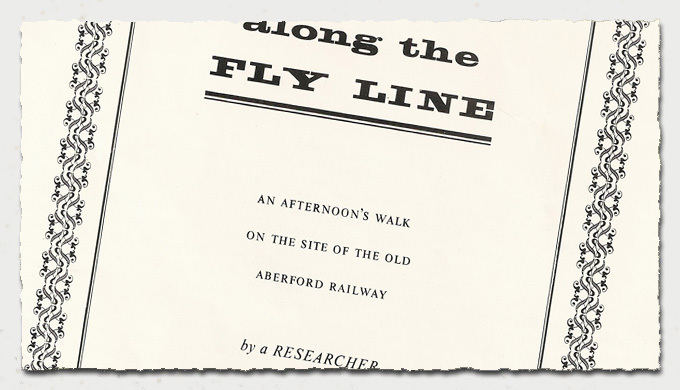 The Aberford Railway closed down in March 1924, and some forty years on, a little known researcher by the name of Graham Hudson took the opportunity to walk along the line of the former railway to ascertain what had changed in the forty years of neglect as he termed it. The pamphlet, of just eight pages including the frontispiece, but excluding the covers, he published through the Chesterfield College of Art, Printing Department in 1965 and set out his thoughts. The pamphlet was a pre-cursor to his later book of 1971 titled The Aberford Railway and the History of the Garforth Collieries , published by David & Charles, sadly no longer in print but can be found on auction web sites from time to time! Graham's book on the railway and collieries is a seminal work, and thanks to his efforts I have been able to build on it to develop parts of my research on Parlington Hall. The pamphlet is pretty scarce, and not well known about, but is intriguing as it reveals a young researcher finding his publishing feet with a fairly short production about the railway. For copyright reasons I cannot reproduce the pamphet verbatim here, but I can précis his article to bring you an insight into roughly the mid point between the closing of the railway, and the present day  situation of this route. The dates for the record are 1924 - 1964 - 2012, so 40 and 46 years between events. Graham opens the piece by telling us he wanted to know what forty years of neglect had done to the Fly Line, so early in the year he walked along the track to discover what remained. He started at the Garforth end, having taken a bus journey to reach the bridge which carries traffic over the railway, of the Leeds - Selby line. This Victorian bridge, from the 1840's, I believe, is still in use today. However few people passing over it realise that a steep set of steps still exists on the north side of the railway from the end of the parapet wall, down to where the ticket office on the platform for the private railway to Aberford was sited. the building was there in 1964 when Graham came to uncover the lost remains of the railway, he described it thus: The building was forlorn and its windows bordered up and the doors had fallen from their hinges. There was no-one now to clip my ticket. From the remnants of the station platform looking north east, today, the building is long gone, you would be confronted by the busy supermarket, Formerly Safeways, but latterly taken over by Tesco after a short tenure with Morrisons; they having to divest themselves of certain properties to meet competition requirements after the take-over of Safeways. 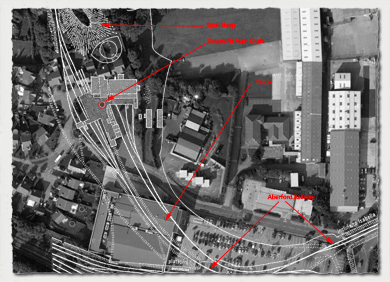 The car park to Tesco was the site of the pit yard and sidings, to Sisters Pit, shown superimposed over the aerial view of the location in the image below. He goes on the describe the shallow cutting where the western junction of the Fly Line had been, and he revealed that a postcard in his possession of some fifty years earlier, showed the cutting lined with bushes, there were trees in Graham's time. Now the whole area is lost to a series of industrial sites and warehouses, it is not until further east that you can pick up any evidence of the former railway. In recent years the remaining spoil heaps that had been from the Isabella pit have given way to a new industrial estate, only some of the former coal miners houses, forlorn in the landscape still give witness to an earlier industrial era, with giveaway names such as Ash Terrace. But as a sop to the Gascoigne sisters, our latter day planners have named the road into the new trading estate as Isabella Road. The boundary of the industrial landscape to the east is inexorably moving towards Aberford, the latest victim being the field adjacent to Aberford Road, by the former Weigh House, a new business park is in progress as I write this article. Earlier it had been subjected to open cast work, before the M1 extension was completed, but now re-instated and supporting only the occasional sheep flock, it is due to become another feeder area into the motorway network. I suspect this will change things considerably within a few years. Following the short description of the state of affairs around the Garforth end of the line Garham turned his attention towards the line as it progressed into the Parlington Estate: But it was getting late and the smoky trees of Parlington were turning to bronze in the afternoon sun. Here it seems he felt the need to add an evocative description, after the rather dour beginnings of the piece, in the remnants of the old industrial landscape, and he continues From here the route of the Fly was clear. This remains true today, after you pass the last transport depot on the left, the line continues at the scale it was when it formed the railway line, gone are the buildings, the tarmac, the fencing and road signs, just straight ahead on a slight embankment towards Hawks Nest, with the remains of old spoil heaps rising off on the left, studded with many silver birch, usually the first tree species to take on old industrial sites, and in recent times the many steep sided undulating mounds are the site for adhoc off-road biking. Graham concluded that Hawk's Nest Cottage and its identical twin at Lilly Pit, were mid Victorian designs and never part of the original railway design, so their purpose is unclear. In my view the cottages may well have been built for the introduction of the steam engines, as from 1870, first the M.W. Mulciber [0-4-0] and then the M.W. Ignifer [0-4-0] were brought into service, probably Hawk's Nest with the adjacent engine shed was a security measure for the train, when left in its shed, and perhaps the cottage at Lilly Pit was to prevent people accessing the estate down the line. Graham described the cottage thus; Further down the path Lilly Pit Cottage guarded the entrance to the woods. These were the Hollins. Among the woods was a melancholy stillness in the branches. Here the sun was shut out and its low beams could not penetrate the aisles of trees. Lilly Pit Cottage is still in existence, sadly a rather ugly garage structure of enormous proportions has been erected adjacent to it, somewhat out of character, and how it ever got planning approval is beyond me, but non the less it is still around and occupied. These days, from the late nineties, with the incursion of the M1 extension to join the A1, the Fly Line is bisected by the roadway and the former railway path runs through a low concrete structure, beneath the M1. The train would not fit beneath the soffit of the box culvert like tunnel, so we will never see the like of it again on the old Fly Line, and once the new business park is complete the Fly Line passing at the foot of the land will be much changed in character. Beyond Lilly Pit Cottage, here the Fly Line is raised considerably on its embankment above the natural landscape on both sides, to the north of the line in the fields at certain times of year can be seen the outcrop of the local coal seams, they are visible on Google Earth, here. Back in the 1960's of course such technology was not available, so Graham, when he mentioned the lost pit; ... Perhaps it was over there that the lost Abraham's Pit had once been, on the edge of the Hollins near Park House was correct in his surmise, if not the pit by that name it has most certainly benn worked by man. A brief scroll to the west shows how close the blackened circular markings are to the site of Park House, albeit at a much lower elevation, Park House being on the top of the hill, by the B1217 Aberford Road. The term Hollins has always puzzled me and I have never come across a definition of it, I wondered if it was a derivative of Hollow, if you know please let me into the secret! [See below] Continuing with Graham in his exploration of the railway route he described the path as quite straight, from Lily Pit onward, until it met a bridlepath crossing at right angles. He pointed out the path as stopping at this point. Well it did then and it still does, the needs of the forestry work in the area have produced a track which is some four feet or more above the narrow cutting in which the railway line ran at this location. Also here in the month of May is a splendid display of bluebells, this alone making a walk on the route worthwhile. At the time of the pamphlet, Graham was trecking over a much colder landscape in March in the late afternoon, so no word of natures display. Interestingly his description states that he had to look about to discover the ongoing route of the line. Today the actual line is well deliniated and once over the hump formed by the estate roadway, the cutting is even more pronounced, and as the line bends round to the north east you are in a deepish cutting with the embankments greater than the height of a person, thus creating a very isolated feeling, and although it runs gently down hill, towards Aberford, the sensation is that you are travelling uphill, a most strange situation. Alongside the railway bed is a shallow watery ditch, and at the end of the cutting, the line has been erased again by more recent earthworks filling over the line, but here and also described in the pamphlet is the so-called Bathingwell Spring, the local plantation hereabouts takes that name, although Graham simply refers to it as the famous medicinal spring which had been such a headache to the engineers. Clearly referring to the engineers building the line in the nineteenth century. Although not mentioned the spring and a couple of others thereabouts are the source of the Crow River and from the cutting right through to the pond adjacent to the Gamekeeper's Cottage the ground is variously wet/very wet/sodden/under water! So his description; I could imagine the train slowly moving through the flood with water dropping from the wheels and the shunter leaning from the cab to look ahead. Is very accurate in all but one respect, the trains on the line always face Garforth, as there was no means of turning them around, that is looking up the gradient, so on his route to Aberford from Garforth in his imaginary train, the carriage if attached and the chaldrons full of coal would have gone into the water first, possibly an issue as it is far more likely to de-rail this way. The shunter would have been looking from the rear! Approaching the Gamekeeper's Cottage the line had two forks one off to the left into the coal staithes for the Hall. Here Graham noted a crumbling platform by Parlington Lane, some evidence of the structure can still be found in the winter months when vegetation is dormant, but to the casual passerby all has gone, and the staithes are only a memory, however Graham recalled a nissen hut over the route of the main line, now also gone. The line also had a branch into the area behind the wall of the cottage, for in here was a coal gas plant, again long gone, so no sign of any former structure. Although I was told that in more recent times the ground had collapsed leaving a gaping hole at this site, probably the former gas plant pit. I also came across some old cast iron inlet pipes from the pond, when it was dredged, the water was used in the gas manufacture, I believe by applying steam over slow burning coal, the offtake is coal gas. Quite a dangerous activity by the Gamekeeper's Cottage, the gas was then piped under pressure, which would no doubt have required a small steam driven compressor, to Parlington Hall. London had gas street lighting from circa 1820, as to when the gas plant at Parlington was operational I know not. A minute or two more walking and the lane brought me to the Dark Arch Tunnel. Graham's description of reaching the old tunnel, he refers to the date of it as post 1849, based on the premise it was not shown on the six inch OS map of that year, and therefore must have been built some time after the railway. By the time of his book, his research has the tunnel built 1813-14. Altogether more logical, how you would construct such a structure alongside an existing railway track might have made him question his assumption, based on the evidence of the OS map. But unlike the Internet, where for the most part you can edit earlier statements to suit a later position, his statement in print stands for as long as there are copies of the publication! Anyone writing about historical matters, must always worry about this fact of life. I recall walking through the Dark Arch with Graham in the mid noughties and we discussed in detail the retaining walls and nature of the stone, which is clearly from local quarries. Also the tunnel was built in three sections, if it was post the railway line, the south wall, which forms the boundary of the railway bed, would have continued in one length, supporting the track bed in use. Whereas the tunnel walls are clearly built with different stone, (size and bed depth) in the three sections. For a full description of the Dark Arch go to the section dedicated to it here. The wooden bridge which spanned the railway from the garden side on top of the Dark Arch to the Deer Park on the opposite embankment receives a mention, but it does not seem that it was in existence then, so it must have been dismantled at some point after the 1930's but before the 1960's, further details of the bridge can be found on page two in this section, and also in the artefacts section here, where a good photograph of it can be found. Graham had a terrific advantage in 1964, as he travelled the railway route, he could view the remains of Parlington Hall, from the high ground by the Dark Arch, he noted that most of the Hall had been demolished in 1960, whereas we know that is not quite right, an article in the Skyrack Express on Friday 3rd March 1961, titled: End of a Stately Home in a Beautiful Setting gave details of some of the last standing structural elements being demolished, and accompanied the article with a photograph of the north east corner of the Drawing Room shortly before it disappeared forever. But, he was only a year out! Details from the paper are here in the Newspaper Clippings Section. By 1964, the same year the whole estate came up for sale by auction. The Hall was reduced to the West Wing and attached Stable Block. Tantalisingly Graham continues about the old hall; ...wandering about its empty rooms or among the forlorn buildings of the estate, as I had often done, it had not been difficult to bring back his ghost [Sir Thomas Gascoigne] from those ambitious days. Well I can't top that, my tenure in the West Wing was great ....but to wander through the ruins, I can only do that in my head! Continuing his walk Graham discussed the Light Arch, and it being raised to accommodate the train Empress, which would suggest circa 1897, however in his later book he acknowledges that the bridge was raised earlier from the onset of the steam trains, therefore pre 1870. Following the section about the hall, the history of it, the estate, and Sir Thomas are expanded, with details of the Triumphal arch. The explanations point to Graham having read the well regarded book by the Rev. F.S. Colman MA titled: History of Barwick in Elmet , published by the Thoresby Society in 1908, since he mentions that the Triumphal Arch was modelled on the Arch to Titus in Rome, as Colman had suggested, whereas detailed observation of the said arch would indicate it to be more in line, but less decorative than the Arch to Constantine in Rome. Concluding the piece, Graham walked along the last leg of Parlington Lane and observed that the train route had passed below the lane in a cutting, and at one point had been filled in where a bridge had stood. To those who know the route, this is where the stile allows access back into Parlington Park , just beyond the disused pinfold quarry. Thereafter with Aberford in sight his journey ended at the former depot, and train terminus, where the coal was dropped from the coal wagons into the coal staithes in the depot some twenty feet below, in the 1960's the site was home to the Aberford Motor Company, today it is an abandoned brown field expanse, and the depot manager's house, re-furbished to a residential property. I understand though, from discussions with the Curator at Lotherton Hall, that Graham was responsible for saving the booking office joinery and it is to be put on display at Lotherton in the near future, his description; From where I was standing the coals had roared into staithes below raising a grimy cloud over the village. The depot-manage's house, with the Fly Line booking office, still stood by the old stables. His last task was to hike up the hill to New Zealand Farm with the promise of hot tea! Those in the know will realise that a life long friend of Graham lived there and still does to this day! He finished; There was no sound in the village as I went up the hill, not a faint whistle or whisper of steam from that narrow road in the whitening woods. There are ghosts at Parlington, but they are far older than that. Regarding the Hollins mentioned earlier in trhe article: A reader from Canada has suggested, I have an 1880 reference book on local nomenclature which states that 'sHollins's is a place where Holly (AS - holi) grows. Seems reasonable, as it is a wooded area.